The police is withholding information from the public about an incident in the town area that placed several children and a large number of road users in lethal danger. 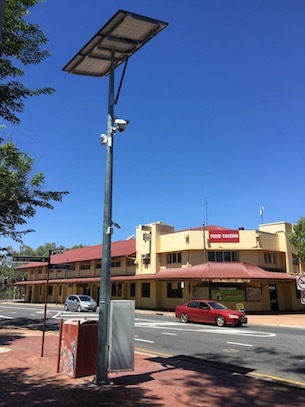 The incident on Sunday night was witnessed by the writer and Alice Springs News Online reporter Kieran Finnane who reported it to the police. We published the story on Monday morning and at 7:47am emailed the police media, giving a detailed description of events, and asking for further details, as well as CCTV images. When we had heard nothing by 7:09am the following morning (yesterday), more than 35 hours after the event, we asked the police for urgent information and sent a link to our original report. At 9:13am we were told that “police are still investigating so we can’t comment”. At 1:45pm came this email: “The offenders are in custody. Police cannot comment further.” We were not told whether charges had been laid. At 4:18pm we were told: “As the matter is before the court, police are unable to comment as it may interfere with court proceedings.” At that time it was too late for us to cover the court hearings. Media have an arrangement to listen to court recordings, providing that the court has given consent. This is what we tried to arrange for this morning. However, to apply for consent we have to quote the name or court file number of the defendant or defendants. Police are withholding that information. This is notwithstanding that the court may suppress names from publication, something we of course always comply with. However, the public could be informed about the nature of the offences, the risk the public was exposed to, the locations, the age of the alleged offenders, the circumstances of the police work, and whether or not children were bailed and on what conditions. What does “unable” mean? Do police not have the the images? If not, after spending millions on the equipment, how can that be the case? CCTV material was freely available from the police on many occasions, such as the attack on the Kittles car yard and the Sadadeen servo ram raid. That claim is patently absurd. Police forces in the free world keep the public informed about investigations. In the NT, nothing will be said about any investigations until they are completed? No answer. Charges being laid are public information. Once matters come before the courts, only what is given in evidence may be reported. Readers contacting us also want to know why no police media release was issued in this case. Police have discontinued the practice of journalists being able to ring the Alice Springs shift or station sergeant between 5am and 6am, for a first hand account of the night’s events. Reporters now have to deal with the Darwin-based media section. It has a member in Alice Springs but most of our negotiations about the joyriders were handled by Darwin staff. These new restrictions on information coincide with growing public concern about juvenile delinquency in Alice Springs, and criticism levelled at Families Minister Dale Wakefield for her handling of the issues. Meanwhile a media release this afternoon says eight vehicles were stolen over night, with the culprits still unknown. “It is alleged unknown offender/s stole a vehicle from a home on Dixon Road sometime between 10pm and 5am. The vehicle was recovered by police today,” the release says. “Police received a report of an unlawful entry of a residence in Araluen where unknown offenders stole a wallet, car keys and a vehicle sometime between 1am and 5:30am. The vehicle has been recovered by police. “Around 3:30am police received another report of an unlawful entry of a business in Wilkinson Street where six vehicles were stolen. PHOTO: CCTV cameras in the immediate vicinity of the car being dangerously driven by the children on Sunday. UPDATE March 15, 8:50am: Four more youths arrested. Police said this morning that four youths are assisting them with enquiries following reports of an alleged unlawful entry, a vehicle being stolen and subsequent police pursuit in Alice Springs overnight. “Police attended to a report of an alleged unlawful entry of a business in Wilkinson Street and observed a vehicle driving away from the premises around 1:20 this morning,” says a media release. “The vehicle, which was identified as being stolen from a business in Wilkinson Street on March 14, failed to stop for police and a pursuit was initiated. They are three males aged 13, 14 and 17 and a 15 year old female. There is no consequence for their actions, they could be “suitable for a diversionary program” or haven’t reached the age of criminal culpability or we will victim blame the criminal offence away. But I guess we are lucky now we can focus on empathy. I witnessed a similar incident that evening too, which I think was the same vehicle. I was walking on the footpath next to the ANZ Bank along Parsons Street when this utility came screeching around the corner from Todd Street and raced towards the Leichhardt Terrace intersection. The utility turned left and charged up towards Wills Terrace where I lost sight of it. When I got to the corner of Leichhardt Terrace, I observed the utility speeding over the Wills Terrace Causeway where it spun around the Sturt Terrace roundabout, tyres screeching, and then charged back along the causeway onto Wills Terrace past the Todd Tavern, when I again lost sight of it. Despite being a block away from most of the action I witnessed, I had no difficulty hearing the young hooligans yelling and shouting. They were clearly defiant and rebellious, and deliberately challenging authorities. Presumably they felt they had nothing to lose by indulging in this behaviour and were heedless of the possible consequences of their actions. And what about the businesses that get broken into and don’t get reported in the media releases? I know because I was the victim and caught the culprit in the act. And then legal aid say my dog is a weapon and may have actions taken against me. Unsure what the inference is here, but the fact that the Minister for Police happens to be the Chief Minister and coupled with the fact that public information deliberately being withheld, is a mere coincidence. Isn’t withholding information that relates to a crime, against the law?